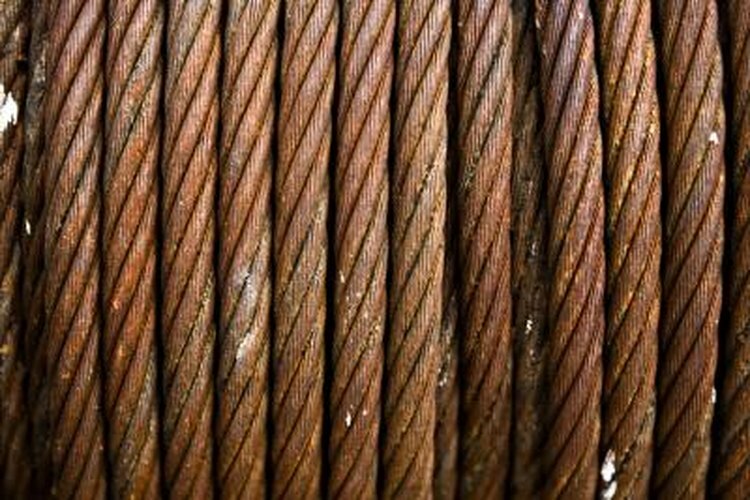 If you need to haul, lift or attach something heavy, steel cable will get the job done. Crimping is an easy and strong way to create loops at the ends of steel cables, which you can then use to connect the cables to heavy items or each other. Thread the end of the steel cable through the crimping sleeve. Bend the end of the steel cable into a loop and feed it back through the sleeve. Push the end all the way through the sleeve but no farther. The sleeve should completely cover the cable. Insert the sleeve and cable into the jaws of the crimping tool. Align the sleeve so that it is held lengthwise between two opposing cups of the crimping tool. Leave 1/8th inch of the sleeve sticking out of the crimping tool. Squeeze the crimping tool hard. This will create a strong joint between the sleeve and the wire. Move the sleeve farther along the length of the sleeve. Continue crimping until you are within 1/8th inch of the other end of the sleeve. Don't crimp the ends of the sleeves, as this will cause them to bite into the cable and weaken it. Samuel Porter has degrees in computer science and law. Before joining Demand Studios, he often wrote technical documents as a part of his software consulting work and contributed to community forums covering a wide variety of technical topics.